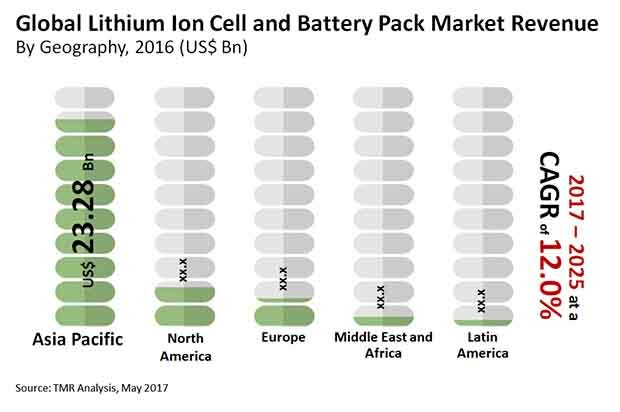 The global lithium ion cell and battery pack market features a fairly fragmented competitive landscape, with the leading few companies accounting collectively for a significant share in the overall market. With rising demand from a number of new application areas such as hybrid and purely electric cars, a number of new players have forayed into the market in the past few years, making it further dynamic and competitive. To survive amid the rising competition, companies are envisioned to focus more on mergers and acquisitions to expand their product portfolios and geographical outreach. Some of the leading companies operating in the market are Toshiba Corporation, GS Yuasa Corporation, Samsung SDI, BYD Co. Ltd., and Panasonic Corporation. According to the report, the global lithium ion cell and battery pack market is expected to register an impressive CAGR of 12% from 2017 to 2025, rising to a revenue opportunity of US$88.92 bn by 2025. In terms of power density, the segment of 100-250 KWh batteries and battery packs are presently the most in-demand variety. Their usage in applications such as high stacking electric vehicles is the key factor raking them high demand globally; thanks to the rising consumption of electric vehicles, the trend is expected to remain strong over the forecast period as well. The segment of lithium ion cells and battery packs with more than 300 KWh power density is also expected to expand at a promising pace owing to their rising set of applications in the field of energy production. Geographically, the market in Asia Pacific accounted for over 72% of the overall market in 2016. Owing to the rising numbers of smart cars, consumer electronics devices, and grid energy, the demand for lithium-ion batteries has significantly increased in the region in the recent times. The market is expected to massively benefit from the rising global demand for electronic devices featuring longer lifespan, which directly positions lithium ion cells better than technologies such as lead acid. Moreover, lithium ion cells and battery packs also feature superior performance over other battery technologies, especially when space is a big concern, thus gaining increased demand from the manufacturers of consumer electronics such as smartphones and tablets. The market is also expected to be driven due to the rising usage of lithium ion batteries in applications such as RFID and barcode scanners owing to their high energy density. Moreover, these batteries are finding increased usage across industrial, energy, and automotive sectors owing to the rising demand for cleaner power sources. However, the market suffers from the issue of the high cost of these batteries, making them unreasonable for certain consumers, operations, or for prolonged usage.